Readers' Forum: Where do I see myself in 5 years? Anyone else run into this? What suggestions do you have? Two key features of the ATH approach can help *any* job seeker. First is the advice to pursue companies and jobs not just job postings. All job boards combined accounted for only 13% of new hires in 2009, referrals and personal contacts 29%. Common sense tells you more than twice as much effort should be directed at the latter. Second, research the companies and jobs you are interested in no matter what the source of your lead. The candidate who indicates they are completely clueless about the company is the candidate the interviewer gets rid of a quickly as possible. our company considers referrals so valuable that they are offering a $2010 finders fee to any employee who recommends and applicant that is hired. Jane, I think we all run into it from very experienced people all the way down to entry level. In fact, people who perceive themselves as super-heroes are the worse job hunter offenders. They don’t think they need help of any kind from any one. It sounds like you’re talking about a grad. And all of the points apply to them as well, unless they forgot why they were going to college in the 1st place. 1-4 is what they need to do to be ready to graduate into job hunting. If they did it wouldn’t be so painful. Networking is the glue that binds 1-4 together & ATH provides a lot of info on that as well. And I think there’s a #5. Followup. I’ve met #’s of people who do some or all of those points, make good headway, then fade away if they don’t get the job. I try to get to a shortlist of at least 2-3 people. Unfortunately we (or back in the day a client) can only hire one. If you hit a shortlist and don’t get a job, it doesn’t mean you’re substandard or you wasted your time. If you hit a short list, likely in parallel you also accomplished #1-4 or key components. Why walk away? Most of the job hunters I’ve worked with fail to understand that they are doing TWO things: hunting for a job of course…and networking. if you hit a short list, you’ve got a win on at least one of them. @Chris Walker: Your job board stats sound like the ones from CareerXroads. While it’s the only study that’s done every year, and I cite it often, I think it’s important to step back and look at the assumptions. I believe the 13% figure you cite is the sum of “source of hires” for the main job boards and a few smaller ones. So, when CXR assigns around 4% of hires to Monster, it’s reasonable to ask how many of those hires are already accounted for in the 3% claimed for CareerBuilder. In other words, I think job boards in aggregate are the source of hires far less of the time than we’re told. The survey is double-dipping, even if unintentionally. CXR does not claim to be able to tease the sources apart accurately. 1. The referral must be contacted by a hiring manager very quickly. Take it seriously, and employees will make good referrals more often. (If employees keep referring turkeys, hoping to get a fee, the program must discourage that.) Handle referrals quickly and adeptly, and everyone takes the program very seriously. There’s nothing like telling a friend you’ve referred them – and 6 months later they haven’t even gotten a courtesy call from HR. 2. The actual payment of the fee must be as proximal as possible to the referring behavior. This is simple behavioral psychology. Companies often break the payment into several parts over a year. After taxes, etc., each payment is too small (and too infrequent) to really motivate employees to make good referrals. Just curious how your company does it. @JaneA: The ATH approach is not cookie-cutter. Everyone must apply it so it works best in their situation. There is no reason a new grad couldn’t follow those tips thoughtfully, if not the same way as a seasoned worker. #3, perhaps the toughest one for a new grad, can be bent: Take a good guess at what would make the business more profitable, and ask the manager to discuss it with you, and explain to you how the job contributes to profit. That stars in important dialogue that sets the candidate apart. Anyone who complains this is just for “rock stars” isn’t trying to do it. They’re merely shaking their heads because it seems to be a lot of work. Well, it is. But so’s that job they want. Might as well start doing the hard work up front. Nick, you are right on. I have been telling everyone I know that your methods are the best, and strongly suggest they subscribe to your newsletter—I posted this column on my facebook and linked-in pages. I also think your ideas work well for anybody building a business and trolling for clients. Happy holidays! Yes, I learned this at a large corporation I used to work for. The candidate I referred had very specialized qualifications, exactly what the other division would want, but no one even called him and HR refused to tell me anything about it. They sneered at me for asking, implying that I was just in it for the money. I learned never to refer anyone again. So yes, it can be good to have a referral program if it is run well but it is worse to have a poorly run program than none at all. IIRC, the referal bonus of $2010 is paid after the candidate accepts an offer and completes his first 90 days. The bonus is paid in one payment minus taxess of course. I have not used the program yet and would not go through HR first. Instead, I would talk to the hiring manager and explain the candidates’s qualifications to see if there was any interest, and only then start the formal process. @John Z: That’s a pretty good plan – entire payment after 90 days. But look at how I would do it: Pay the entire amount when the new hire starts the job. Why? Because the employee’s job is done. What happens next is between the employer and the new hire. Someone will suggest that employees would game the system, have friends take jobs, then quit after the fee was paid. I don’t see that. A whole lot of trouble for a coupla grand? Employers should put their necks on the line if they want good referrals. Pay it all at once, when the new hire starts. Nick–Agree completely with your analysis of the careerxroads.com numbers. But, they are the only numbers we have. God knows, none of the job boards do any analysis of their effectiveness. I deal every day with people who’s only job search activities are centered on job boards; they’ve been brainwashed. The 13% figure, even if it is inflated, is sufficiently shocking to get their attention. I try to use that attention to make the two points in my earlier comment that was directed at those who think the ATH method is only for executive types: spend more time pursuing companies than job postings, and carefully research every opportunity you pursue. These apply whether you are looking for a position as CIO or forklift driver. There are a few companies in my area that have quite aggressive referral programs. I never have a problem getting reps from them to come to speak to my job search skills seminar. I like the idea of the referral program, but it is not implemented at my workplace. Even if it was implemented, I would not refer someone. Our HR department and many hiring managers are all about how many letters you have after your name. We have a new hire who had all the right letters after the name but cannot do the job, even after one year. The ATH method of searching for a new job makes sense and is one that I will use as I begin to search again. @Nick C: Thanks for the reminder that the ATH approach needs to be modified for particular circumstances. As a matter of fact, I do talk to new graduates and this will be really useful. I rather suspect that some of these people are stuck – or maybe a better word for that is afraid. They feel a bit overwhelmed by life anyway, and they think that the traditional methods don’t require much of them. They see the alternative as requiring them to have a high degree of self-confidence. That’s true, but how far does low self-confidence get one in an interview if one goes the traditional way? Not very far, as I see it. I completely agree that “making the short list” is a win. If you are a real hiring manager, you are networking with other hiring managers and will be sharing information and prospects. I have referred several people who made my short list to others in the field who need to hire someone as well as hired people referred to me from my contacts. Actually, my biggest rising star was referred to me a contact within another organization. @Don, @rck: The cross-company referral is one of the most misunderstood, most powerful recruiting tools available. Some managers are afraid to refer a candidate they don’t need to another company. Most never even think to do it. 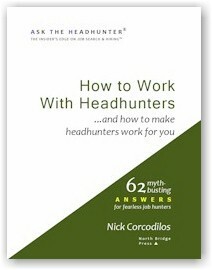 Consider how headhunters recruit: We talk to people at one company to get referrals for another company (our client). We get paid about $30,000-$90,000 for doing this. (That’s the fee we earn.) Any manager can do this, and when a manager doesn’t do it, he’s not doing his job. The value it pays back when you do it for a candidate you’re not going to hire is immense. People never forget that kindness, which is actually a very pragmatic business action. The network of people who cooperate on this level is incredibly tight – it’s where the best hires come from. Nick, rck: you’re on the mark. There’s no downside to helping out a solid candidate, from the standpoint of your own networking and from a business sense. like rck I’ve picked up some good folks via another manager and I’ve done likewise. But in my experience most managers can’t think past their own patch. And I agree, if that’s all they are doing they aren’t doing their job. True on cross company networking, but it’s equally true inside companies. Especially the point about not doing their jobs. When you recruit with blinders on, taking care of your own space, you’re not doing the rest of the job, simultaneously hiring for your Division, Company per se. If a candidate doesn’t meet your need & they are a good candidate..then see to it that other parts of the company are made aware, particularly those where you KNOW this person’s a fit. Don’t rely on the HR folks to do this. They might, but they might not. Siloing is rampant inside companies, so make a personal effort. I’ve personally walked people’s paper to a manager who I felt should personally know about the person. It’s good business beyond a kindness. There’s something going on in companies called “reorgs” That person could end up working for you anyway…or you working for him/her. The problem is that we often let the “process” distract us from what really makes a difference in our work – personal effort. I think I’ve told this story on the blog before. During a search I was doing for a client, I was reminded of a manager in the company for whom I’d done work in the past. After some elliptical discussions with him to confirm my suspicion, I went back to my client and told him the best candidate was already in the company: the manager I had just spoken with. It cost me a fee and a placement, but it was fun to work on the sideline, helping my client “recruit/steal” an internal person from another group. The “placement” worked out great. While the system doesn’t direct us to operate this way, personal effort with a mind toward getting the job done is almost always the solution. Nick helping someone inside was a class act. Unfortunately in corporations, especially the biggies the opposite happens. The reward for doing a good job frequently is to be boxed in by a selfish, unfeeling, & most likely insecure manager. Instead of helping someone along the way, which is what they should do for the company, they block the movement. They don’t want to let go of their best guy/gal. They’re are often afraid of how their subsequent performance will look. Then the siloing. I ran across the term once that was so fitting to many corporations…”a loose knot consortium of warring tribes”. God forbid that one would help another one. What you did was provide and end run around the often stifling rules of engagement to minimize poaching (not necessarily bad). Even if you get a good rep, an interested manager has to OK an approach to someone else’s staff. that’s what I meant by body block. There are internal posting systems, but again your manager has to OK the move. I’ve got some nuclear-hard silos to deal with. And a boss who kind of likes having everyone comfortably placed in a particular bin in a particular silo. I was hoping that an upcoming reorganization would help break down the silos, but it looks like the reorg is only going to be superficial and won’t change anything. Guess I’ll have to stop being lazy and continue trying to subtly break down the walls. I’ve been accused of poaching, trying to take control of other parts of the organization, sticking my nose into the business of other organizations (AKA mentoring), and probably other things. Of course, I’ve been also accused of pushing people in my organization for open positions, ignoring the needs of other parts of the organization, and not taking an interest in the development random individuals. I’m a big boy though. I can take it. And I can give it as needed. Frustrating yes. Nature of the work, yes as well. @don: Here’s the coda to that story. A senior HR rep that I worked with closely in that company developed some interesting ideas after I completed a series of “how to recruit like a headhunter” workshops for her HR team. She put together a business plan for an “internal headhunter” position for herself. The HR leadership liked it a lot and decided to let her do it. Here’s where HR trumps the hiring managers. The plan was killed when word got out that she’s be free to recruit internally with impunity. Managers feared she’d steal their best people and move them elsewhere in the company. Her plan pointed out that the people she’d be recruiting were probably the ones who would be most susceptible to external recruiters anyway – that is, if she didn’t recruit them, there was a good chance the company would lose them altogether. No dice, said management. In the end, a couple of years later, she left the company to start her own business. Two lessons, I think: Employers are more paranoid than smart, and HR sometimes thinks and acts more progressively than the rest of the company. @rkc: “People are our most important asset.” Your problem, my friend, is that you act like that’s true. Take care of your people, help them optimize the leverage they have in your company, and then they ARE the company and the company thrives. Consider what it means when your company discourages you from actively promoting internal movement. If the company fears such internal competition, then it’s probably incapable of truly competing with other companies. A shame. Nick the internal recruiting story is very timely in my regard. In the small company I’m working in, it so happens that we are (have) built in the recruiting process the spirit and act of “internal recruiting”. We (there are two of us) have proposed and executed a proof of concept (POC) on the idea of extending recruiting inward. Not just internal posting or notifications, but active networking on our part with the managers and rank/file. If we hear of, or they tell us they have an aspiration to make a move we take ownership of it and push for closure. (action plan/development plan). we make sure the internal people get 1st rights of refusal on a job before we go outside. We especially make sure the management team knows about everyone in play, and those transactions included in a hiring plan. We go through an interviewing process whether or not a current opening exists. This doesn’t mean that if someone aspires they get what they aspire to. the usual caveats are in play, they have to be a good performer, they can’t leave their current boss swinging in the breeze, and they may have to do some work to become qualified. What’s most important the President of the company likes and supports the idea. Great list of job tips. I just stumbled onto your blog and now that I know the basics, I will definitely be visiting more often! Nick, your comments of 25 December to Don and rkc are correct. There seems to be a lot of paranoia, distrust, and insecurity with management (generally speaking, of course, because maybe somewhere in America there is management that doesn’t act threatened by its best workers), which results in the best people leaving or being let go because the workers were smarter and contributed more than management. I’ve seen it too many times, then watched the organization fall apart, and watched management scratch its collective head as they asked themselves why this or that wasn’t getting done. Duh! They let go of the people who did those jobs, decimated that particular dept. (who performed those jobs), and only after those employees are no longer there to do those jobs and the jobs/tasks go undone, does management wonder why. A former colleague once told me “higher they go, stupider they get”. Another former boss told me that the school (we worked at a state university) promotes people to the level of their incompetence–if they needed someone to handle the finances, budget, etc., the last person they would consider was someone with experience and/or education in that field but would instead promote someone with no knowledge and who didn’t care, and who then proceeded to screw things up very badly. I truly worry as I am currently unemployed and hope that when/if I go on job interviews, I’ll be able to see the warning signs and not take a job with a company or university that doesn’t have its act together or that demonstrates an unwillingness to recognize the good work done by employees and/or who are unwilling to promote from within.